the serverless school: End of year report for BYOD. 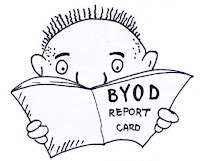 End of year report for BYOD. Was Bring Your Own Device (BYOD) in schools ever a good idea? Lets take a step back. The year was 2010 and the web was already full of engaging educational content. The move towards anytime, anywhere learning had the potential to bring substantial benefits to education but only if students had access to an internet friendly mobile device. Faced with an aging estate of netbooks and laptops, a dusty old IT suite running Microsoft XP and budgetary constraints it seemed logical to address this issue by allowing students to use their personal smart phone, iPad, or tablet in the classroom. The devices were coming through the school gates anyway so why not turn a problem into an opportunity. Schools assumed that this would lead to a proliferation of device types but believed that by creating a multi-device classroom students could work collaboratively, choosing to work with the most appropriate device and in the end it would all be well. Although BYOD addressed the immediate problem it also served to create whole a new set of challenges mainly around the areas of compatibility, security and management and so it might be a good time to see were we are with this initiative. In all truth BYOD never had a hope of meeting the high expectations of education once the realities of the classroom set in. I have no empirical evidence for this but most BYOD programs that I have come across simply provide the student with a school funded data plan for their smartphone and while BYOD made it to school, it never quite got into the classroom. There was too much temptation to work to the lowest common denominator which helped nobody. A common reaction was to employ variations of the BYO-SAD model (Bring Your Own School Approved Device) which was often viewed as backdoor approach to parental contribution and ran into problems with inclusion since the 'school approved list' normally only ever contained one item - an iPad. Even with some standardisation the problems were only just starting to emerge. Schools often found that introducing BYOD impacted the performance their nascent wireless network. From supporting a class-set of laptops the admin suddenly had three hundred disparate devices on the network. A software management suite became essential and what looked like a quick fix now required a wireless upgrade and the onboarding tools necessary to control access to the network in a secure manner. But these were personal devices outside the authority of the school. How do you place them under policy control in an acceptable way without incurring a MDM licence that was never budgeted for? In many cases the management overhead became impractical or too costly and so the grand scheme was reduced to a glorified guest network for students who, to their credit used it as a real learning resource as well as catching up with friends on Snapchat, Wikr and WhatsApp during the recess. Unfortunately after the first e-safety concerns were raised it was found the edge security solution couldn't filter the traffic and had no way of blocking applications from devices without incurring a another management licence and the displeasure of the student body. The cheap and easy solution suddenly wasn’t looking so cheap or so easy. 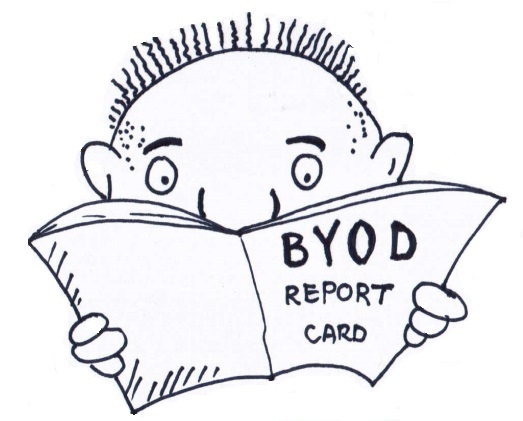 So where does that leave BYOD in 2015, pass or fail. I think there are two ways of looking at this. One grade card has an FAIL F- and proposes replacing BYOD with a properly managed 1:1 programme to solve these issues. The principal driver for BYOD was cost and this has been massively reduced by the introduction of commodity devices such as Chromebooks and cheaper tablet options. We may have reached a point where the amount of time and money used to manage BYOD is fast approaching what it would take to implement a proper 1:1 Chromebook/tablet programme on a unified platform. Other marker says PASS B- but don't try and manage it because without spending serious money on MDM licences you’re wasting your time. If you want a ‘managed’ environment you have to control the end user device. The move towards secure encrypted communication in the last few years now means that peeking at the traffic to find out what’s going on is not going to tell you what you want to know. Students are smart and without complete control of the user device they’ll get around any mechanism put in their way. So if you want BYOD you'll have to open it out and trust your students. After all it's their device and they are the new masters of the digital world.